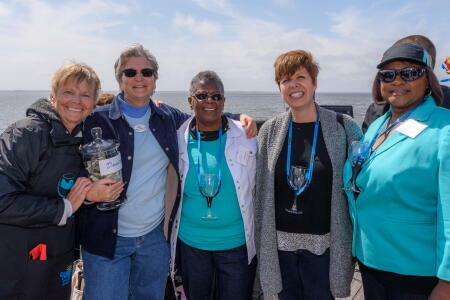 The board of advisors of the Currituck-Dare Community Foundation (CDCF) successfully hosted the 8th Annual Duck & Wine Festival (www.duckandwine.com ), in partnership with Coastal Cantina at The Duck Waterfront Shops. The sold-out festival brought together 600 attendees on April 30 to enjoy the one-day restaurant cook-off judged by a panel and event participants. Each chef created a dish prepared from duck donated by Maple Leaf Farms and paired it with a wine selected by Coastal Cantina. The festival highlighted the talents of local restaurants, attracting both local residents and out-of-town visitors. Funds raised from the festival benefit the community foundation’s local grantmaking program, according to Janet Colegrove, CDCF board president. The CDCF grantmaking cycle opens on July 1 and closes at noon Aug. 2. Interested applicants are invited to a grantseekers workshop on June 1 from 2-4pm at 102 Town Hall Drive, Kill Devil Hills. The CDCF has also named three nonprofit partners to receive some of the proceeds from this year’s event: Kids First, the Historic Jarvisburg Colored School and Food for Thought. In addition to grants provided through this event, the prize money awarded to the winning chefs was allocated to local nonprofits of their choosing. “This event is all about having fun for a good cause,” said Lynne Alterman, CDCF board member and event co-chair. The CDCF board and committee would like to thank this year’s sponsors: Maple Leaf Farms, Twiddy & Co. Realtors, Towne Bank of Currituck, Carolina Designs Realty, Steve Alterman Photography, Duck Waterfront Shops, The Blue Point, Bonterra Wines, OBX Chevrolet, Corolla Classic Vacations, 8 Dot Graphics, TNT Services, Sun Realty, In The Lens Photography by Bill Birkemeier, OBX Beach Buggies, Untucked and Zen & Zip.